Map of the major sedimentary basins of Central and West Africa. Sedimentary basins are regions of Earth of long-term subsidence creating accommodation space for infilling by sediments. The subsidence can result from a variety of causes that include: the thinning of underlying crust, sedimentary, volcanic, and tectonic loading, and changes in the thickness or density of adjacent lithosphere. Sedimentary basins occur in diverse geological settings usually associated with plate tectonic activity. Basins are classified structurally in various ways, with a primary classifications distinguishing among basins formed in various plate tectonic regime (divergent, convergent, transform, intraplate), the proximity of the basin to the active plate margins, and whether oceanic, continental or transitional crust underlies the basin. Basins formed in different plate tectonic regimes vary in their preservation potential. On oceanic crust, basins are likely to be subducted, while marginal continental basins may be partially preserved, and intracratonic basins have a high probability of preservation. As the sediments are buried, they are subjected to increasing pressure and begin the process of lithification. A number of basins formed in extensional settings can undergo inversion which has accounted for a number of the economically viable oil reserves on earth which were formerly basins. Example of a sedimentary basin in a half-graben. Sedimentary basins form primarily in convergent, divergent and transform settings. Convergent boundaries create foreland basins through tectonic compression of oceanic and continental crust during lithospheric flexure. Tectonic extension at divergent boundaries where continental rifting is occurring can create a nascent ocean basin leading to either an ocean or the failure of the rift zone. In tectonic strike-slip settings, accommodation spaces occur as transpressional, transtensional or transrotational basins according to the motion of the plates along the fault zone and the local topography pull-apart basins. An example of a basin caused by lithospheric stretching is the North Sea – also an important location for significant hydrocarbon reserves. Another such feature is the Basin and Range Province which covers most of the USA state of Nevada, forming a series of horst and graben structures. Another expression of lithospheric stretching results in the formation of ocean basins with central ridges; The Red Sea is in fact an incipient ocean, in a plate tectonic context. The mouth of the Red Sea is also a tectonic triple junction where the Indian Ocean Ridge, Red Sea Rift and East African Rift meet. This is the only place on the planet where such a triple junction in oceanic crust is exposed subaerially. The reason for this is twofold, due to a high thermal buoyancy of the junction, and a local crumpled zone of seafloor crust acting as a dam against the Red Sea. If a load is placed on the lithosphere, it will tend to flex in the manner of an elastic plate. The magnitude of the lithospheric flexure is a function of the imposed load and the flexural rigidity of the lithosphere, and the wavelength of flexure is a function of flexural rigidity alone. Flexural rigidity is in itself, a function of the lithospheric mineral composition, thermal regime, and effective elastic thickness. The nature of the load is varied. For instance, the Hawaiian Islands chain of volcanic edifices has sufficient mass to cause deflection in the lithosphere. The obduction of one tectonic plate onto another also causes a load and often results in the creation of a foreland basin, such as the Po basin next to the Alps in Italy, the Molasse Basin next to the Alps in Germany, or the Ebro basin next to the Pyrenees in Spain. Deformation of the lithosphere in the plane of the earth (i.e. such that faults are vertical) occurs as a result of near horizontal maximum and minimum principal stresses. The resulting zones of subsidence are known as strike-slip or pull-apart basins. Basins formed through strike-slip action occur where a vertical fault plane curves. When the curve in the fault plane moves apart, a region of transtension results, creating a basin. Another term for a transtensional basin is a rhombochasm. A classic rhombochasm is illustrated by the Dead Sea rift, where northward movement of the Arabian Plate relative to the Anatolian Plate has caused a rhombochasm. The opposite effect is that of transpression, where converging movement of a curved fault plane causes collision of the opposing sides of the fault. An example is the San Bernardino Mountains north of Los Angeles, which result from convergence along a curve in the San Andreas fault system. The Northridge earthquake was caused by vertical movement along local thrust and reverse faults bunching up against the bend in the otherwise strike-slip fault environment. In Nigeria, the dominant type of basement rock intersected by wells drilled for hydrocarbons, limestone, or water is granite. The three sedimentary basins in Nigeria are underlain by continental crust except in the Niger delta, where the basement rock is interpreted to be oceanic crust. Most of the wells that penetrated the basement are in the Eastern Dahomey embayment of western Nigeria. A maximum thickness of about 12,000 m of sedimentary rocks is attained in the offshore western Niger delta, but maximum thicknesses of sedimentary rocks are about 2,000 m in the Chad basin and only 500 m in the Sokoto embayment. As more and more sediment is deposited into the basin, the weight of all the newer sediment may cause the basin to subside further because of isostasy. A basin can continue having sediment deposited into it, and continue to subside, for long periods of geological time; this can result in basins many kilometres in thickness. Geologic faults can often occur around the edge of, and within, the basin, as a result of the ongoing slippage and subsidence. The study of sedimentary basins as a specific entity in themselves is often referred to as basin modelling or sedimentary basin analysis. The need to understand the processes of basin formation and evolution are not restricted to the purely academic. Indeed, sedimentary basins are the location for almost all of the world's hydrocarbon reserves and as such are the focus of intense commercial interest. ^ a b Allen, Philip A.; John R. Allen (2008). Basin analysis : principles and applications (2. ed., [Nachdr.] ed.). Malden, MA [u.a. ]: Blackwell. ISBN 978-0-6320-5207-3. ^ a b c d Cathy J. Busby and Raymond V. Ingersoll, ed. (1995). Tectonics of sedimentary basins. Cambridge, Massachusetts [u.a. ]: Blackwell Science. ISBN 978-0865422452. ^ Dickinson, William R. (1974). Tectonics and Sedimentation. Special Publications of the Society for Sedimentary Geology. 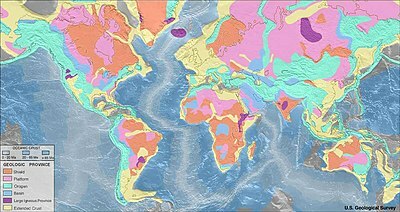 Wikimedia Commons has media related to Sedimentary basins.